The new Belkin FlyWire is the simple solution that gives you the freedom and flexibility to place your HDTV where you want—without cables. 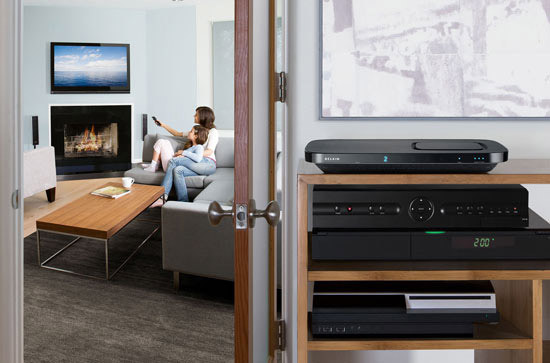 Featuring an intuitive and simple setup, FlyWire wirelessly connects devices such as Blu-ray® players, receivers, video-game consoles, and set-top boxes to HDTVs and projectors, transmitting high-definition 1080p True Cinema picture resolution with whole-home range. As the first offering in the FlyWire family, this solution provides a whole-home range with the capability of penetrating walls and AV cabinets. You can now hide your AV components away in a cabinet or a closet, creating an uncluttered living and home-entertainment environment. You can also mount your projector on the ceiling without the hassle of cables. Operating in the open 5GHz band, FlyWire offers a completely robust connection. It intelligently manages its own connection, adjusting both frequency and power to avoid interference and overcome impedances. Because FlyWire does not compress video, it transmits video content with no latency. Even the most demanding AV applications, like video games, will not be impaired by the wireless transmission. FlyWire’s SD card slot also allows for upgrade and expansion options. 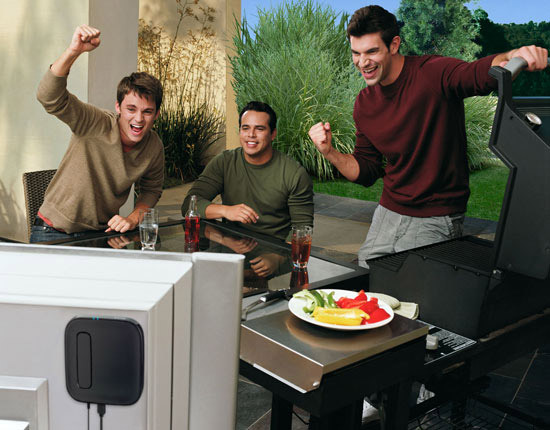 FlyWire comes with a transmitter that connects to your AV components (digital HD or analog) and a receiver that mounts to your HDTV, allowing you to place your HDTV in the living room, kitchen, or even outdoors. With custom installation costs reaching up to $3000, FlyWire gives you the same custom-installed look without the complications, mess, and labor of wiring. In a 2007 study by Parks Associates, researchers found that 49% of respondents wanted to mount their flat-panel TVs; however, only 28% were successful in doing so. The CEA indicates in their January 2008 Industry Forecasts report that sales of flat-panel TVs in 2007 grew year-over-year by 52%. ABI Research projects installations of wireless HDTVs to grow 142% between 2007 and 2013. Wireless connectivity between HDTVs and home theater equipment is the next big thing on the horizon for living-room consumer electronics. With the proliferation of flat-panel TVs, consumers are now confronted with how to position their TVs in their living space in the cleanest way possible. People want more flexibility in where they place their TV and they don’t want to worry about wiring it to the rest of their equipment. The FlyWire solution uses a robust wireless technology designed specifically for transmitting video signals and is a solid approach to enabling wireless HDTV flat-panel installation. More and more people are buying HDTVs, but once they bring them home, they’re realizing that there are limitations as to where they can actually place their new TVs. These limitations include: awkward media niches built into living room corners, high costs and challenges of mounting TVs above fireplaces, and unsightly cables running along walls. FlyWire solves these problems so that people can take back their living rooms and design their living rooms the way they want.